This is a simple and quick pickle to make, for when aubergines are in season. Makes approximately two x 1/2 pint jars or 500-600 ml. A couple of large aubergines, approximately 500-600 gm. 1 tsp. tamarind concentrate or puree*, or 1/2 inch tamarind piece off a tamarind block. * Tamarind puree can be bought in jars from Oriental/Asian grocers. It is much better than the dark coloured tamarind concentrate, it is just tamarind pulp with fibrous bits removed. If using tamarind block, break it up and soak in 60 ml. or 1/4 cup of hot water. Leave to soak for an hour or so. Mash with fingers and strain through a wire sieve. Slice aubergines into 5 mm. thick discs. 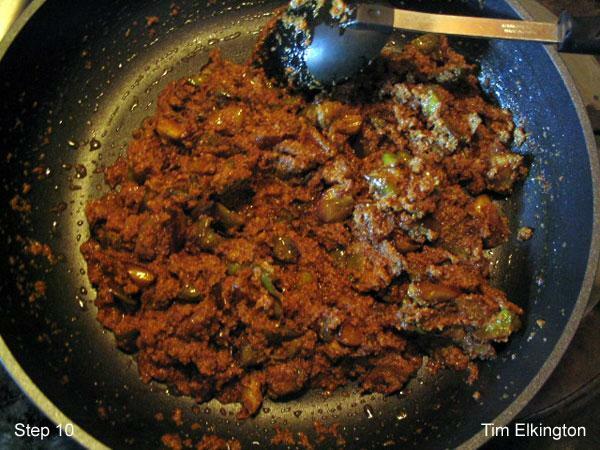 Mix salt and turmeric powder and coat the aubergine slices with this mix. Keep aside. 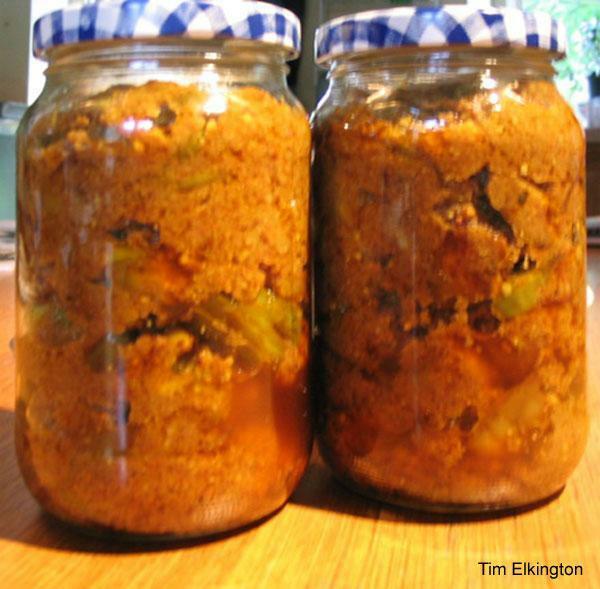 Place vinegar, onion, garlic, ginger, green chillies and mustard seed in a grinder/blender and make into a smooth paste. Keep aside. Measure all the spices into a bowl. 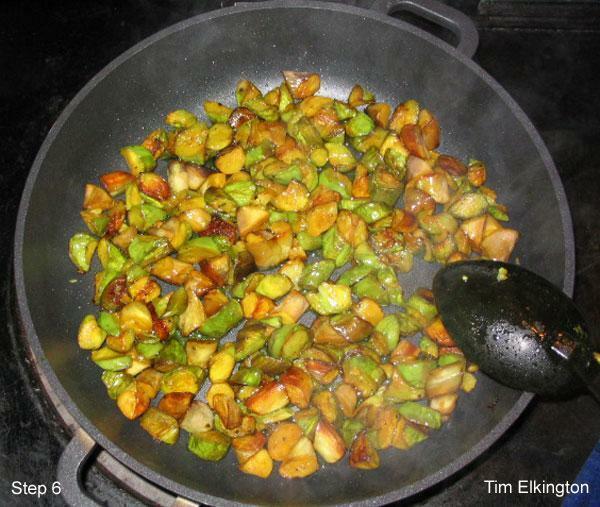 Heat 1/3rd of the measured oil in a large frying pan and fry aubergine slices on both sides, until nicely browned. They should be fried in single layers and cooked on moderate heat, so that they fry quickly and don't get too mushy. You will need to add more oil for fresh batches of aubergine slices. Aubergines absorb a lot of oil during frying, but do bear in mind that a) it is a pickle and only a little is eaten at a time, b) oil helps to preserve it. Heat the remaining oil and add cinnamon stick (if using cinnamon powder, add at the step 9, with other spices). Add onion paste and fry on medium heat, until oil separates. Add all the spices and tamarind concentrate. Stir for a 20-30 seconds. Add aubergines, cover and simmer gently for 5-6 minutes. Adjust salt, add sugar and stir gently. Allow to cool a little and fill in sterilised jars. A pinch of sodium benzoate added to pickles, acts as preservative and helps to keep them for longer without getting spoiled.